A new interactive exhibit at the San Bernardino County Museum invites visitors to learn the science behind hydroelectric power with hands-on activities and informative text panels. 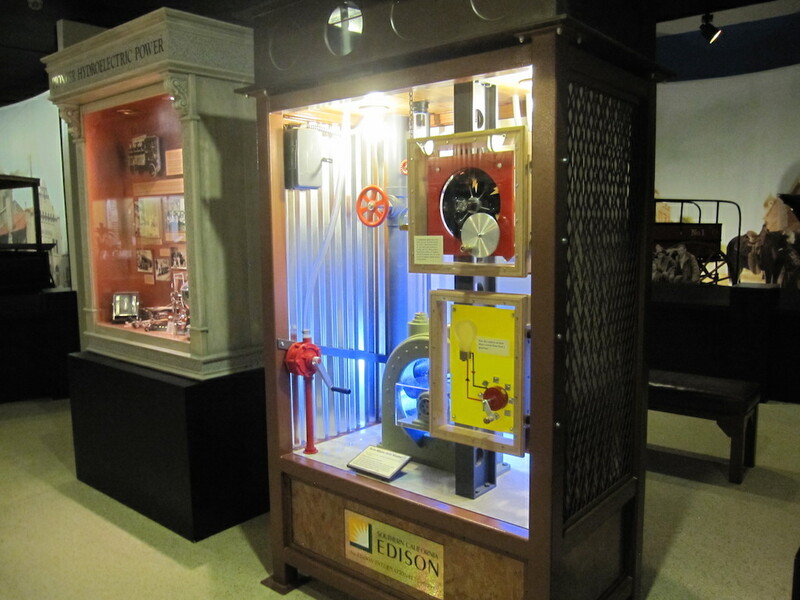 The display, funded by a grant from the Edison Foundation, enhances the current exhibit of hydroelectric power in the museum’s Hall of History. The exhibit is included with paid museum admission and will continue indefinitely. Inland southern California was a pioneer in hydroelectricity. Mill Creek No. 1, built by the Redlands Electric Light and Power Company, began operating on September 7, 1893. It was the first commercial use of 3-phase alternating current generators in the United States. The power was transmitted more than seven miles to the city of Redlands as well as to a nearby ice house. The demand for electricity was so great that an additional generator was added less than 3 years later. Among the hands-on components in the display is a demonstration of how magnets work with motors; how direct current flows; and how falling water can turn a Pelton wheel to generate electricity. Text panels explain electricity vocabulary, offer hints on saving energy, and present a map showing the variety and distribution of various power sources throughout the state of California. There’s even a panel to introduce visitors to the “Current Wars”—Edison vs. Tesla! “Very fun – kids loved it,” “The kids like making energy with water,” “Easy to understand and very informative,” and “It is a very interesting exhibit” were among the comments from museum visitors during the exhibit’s opening weekend. The San Bernardino County Museum is at 2024 Orange Tree Lane, at the California Street exit from Interstate 10 in Redlands. The museum is open Tuesdays through Sundays from 9 am to 5pm. General admission is $10 (adult), $8 (military or senior), $7 (student), and $5 (child aged 5 to 12). Children under five and Museum Association members are admitted free. Parking is free. For more information, visit www.sbcountymuseum.org. The museum is accessible to persons with disabilities. This exhibit is really helpful and insightful especially for those who are interested in water-based motors and hydraulics.